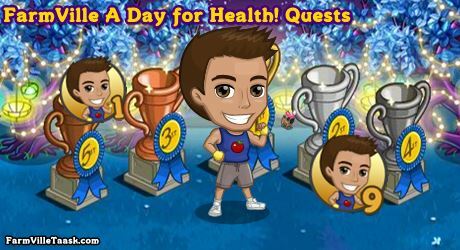 Join our friend Juicy Joe in another exciting fitness week in FarmVille A Day for Health! Quests 2019. Come and join him as we celebrate the World Health Day by dong some healthful activities. Let’s gather up and look for the best gym in town. In this FarmVille Quests, we are going to craft 9 recipes at the SPA, WINERY or BAKERY. You may prepare ahead by collecting the bushels early. You can find the list of the bushels just below of this guide. Note: Expected to be released on Thursday (April 4th). Info: Crafted at the SPA and will need Gilded Flower Bushel x9, Morning Glory Bushel x9 and Red Tulip Bushel x12. Info: Crafted at the BAKERY and will need Butter & Sugar Corn Bushel x9, Wheat Bushel x9 and Ginger Bushel x6. Info: Crafted at the SPA and will need Iris Bushel x2, Sunflower Bushel x4 and Pepper Bushel x2. Info: Crafted at the BAKERY and will need Pattypan Bushel x6, Onion Bushel x4 and Rice Bushel x6. Info: Crafted at the WINERY and will need Tomato Bushel x6, Pepper Bushel x2 aand Carrot Bushel x6. Info: Crafted at the SPA and will need Green Tea Bushel x8, Ghost Chili Bushel x4 and Sunflower Bushel x2. Info: Crafted at the WINERY and will need Wheat Bushel x2, Rice Bushel x3 and Raspberry Bushel x3. Info: Crafted at the WINERY and will need Strawberry Bushel x6, Raspberry Bushel x4 and Cranberry Bushel x6. You need a BAKERY (not a Winery)!